While wearing this ring, you will receive 100 extra health and your claw attacks will do an additional 20 damage. 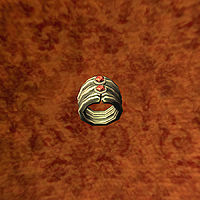 The Ring of The Beast is a ring retrieved as part of the Rings of Blood MagicDG quest. The ring is made of three bands of bone, with two orange jewels set into it. Its enchantment gives you 100 more health and causes your unarmed attacks to deal 20 more damage. Unlike most other rings, its bonuses will still apply when you are in Vampire Lord form. The description for the Claws enchantment in the active effects menu erroneously reads "Khajiit claws do four times the damage of a man's punch."